Join the Champion Athletes of 2017. I was going to start this off by talking about Spring coming up in the USA. But hey, this is the World Wide Web anyway, so I need to fully recognize (recognise?) that Autumn is also on the way. If you, or someone you love, is living with diabetes and working toward or accomplishing an athletic goal, I have a brand spanking new medal for you. We’ve given over 80 of these away over the past 3+ years, to people in places as close to me as Virginia and Pennsylvania, and places as far away as New Zealand and India. I am always so happy to read about someone overcoming their fears, gaining confidence, and giving the extra effort to reach that achievement they’ve been working toward. Whether it’s your first run, a milestone bike ride, or literally a mountain you’ve always wanted to climb, your effort should be rewarded. 2. The athletic event must have taken place in the last six months. For now, we’re going with a pretty loose interpretation of the word “event”. We have medal winners who are runners, ballroom dancers, swimmers, motocross riders, and curlers. If you feel you’ve accomplished something important to you, that’s an event. If you meet the above criteria, you qualify for a medal. So… as you consider signing up for that event this year… as you consider getting those 10,000 steps in every day, or hopping on the bike in the evening, think about what it means. Think about how your efforts are making a difference for you and your loved ones. Consider how great it feels to get a hard won victory over diabetes. Then go out and make history. 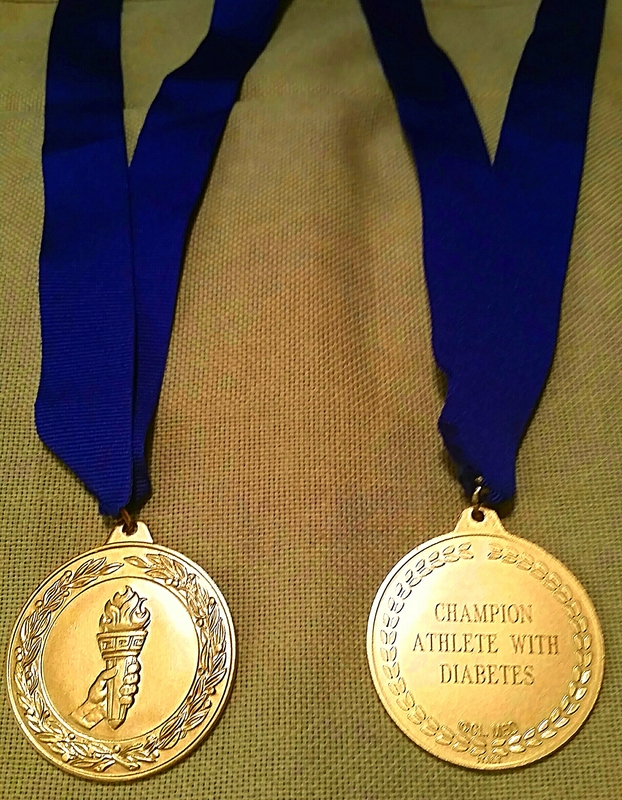 Be a Champion Athlete With Diabetes. That’s right… I’m back. Back from Florida (more about that soon), and back as an athlete. 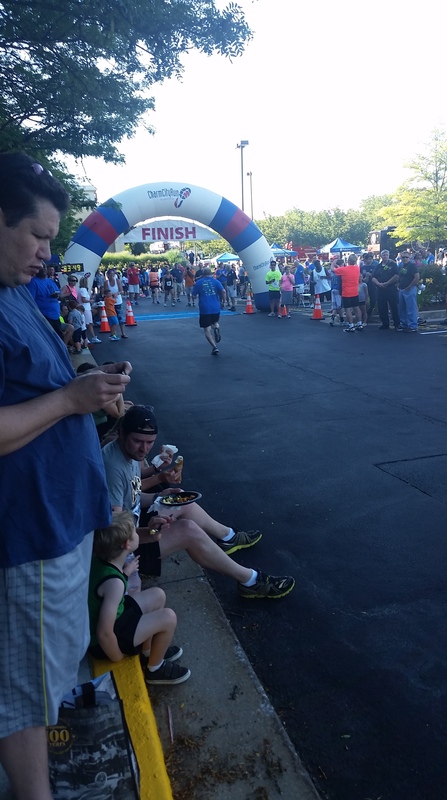 Sunday marked the yearly occurrence of my local neighborhood 5k run. 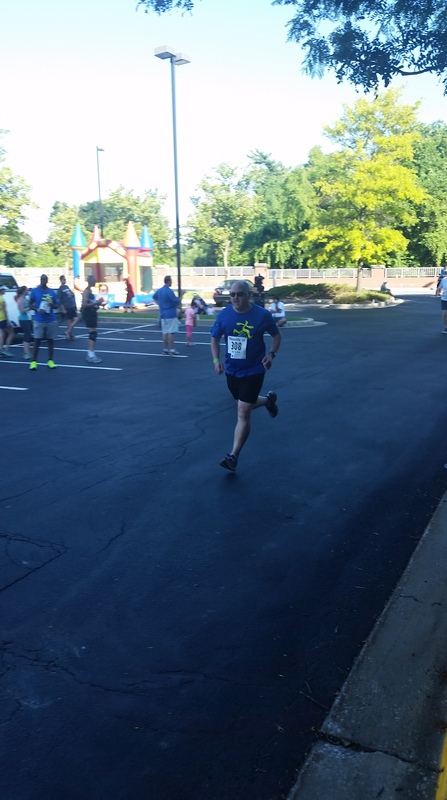 The 2014 5k was the last athletic event I participated in before my knee was injured and repaired last year. 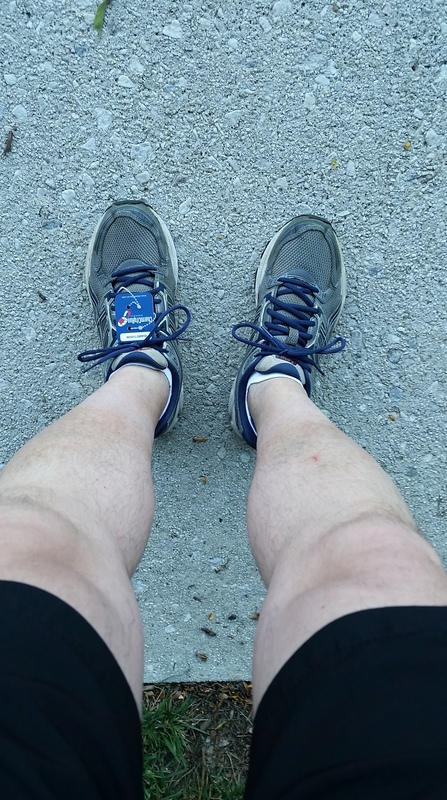 It was a difficult process, getting my body down to a workable weight, and getting my stamina up to the point where I could cover 3.2 miles without passing out. Even three weeks ago, I couldn’t cover two miles without wheezing and gasping for half an hour after. Could I make it all the way? My goal (beyond finishing) was to finish in 40 minutes or less. From the photo above, you can see that I finished in just under 34 minutes, which is faster than I’ve run all year. My diabetes played well all day. Just a little high (170 mg/dL) at the beginning of the run. I ran a 30 percent temporary basal for an hour, beginning just before the race began. The end of the race saw a 148 mg/DL. Well played, Stephen. There are many factors that went into this successful effort. But there’s no denying: I’m back. And it feels so good to be back. Now I know I can do it. Don’t ask me what my next event will be. But now I know there will be another event. That makes me very happy. Diabetes + Cancer? No problem for this Champion Athlete. It’s Friday, so how about something to make you feel good? 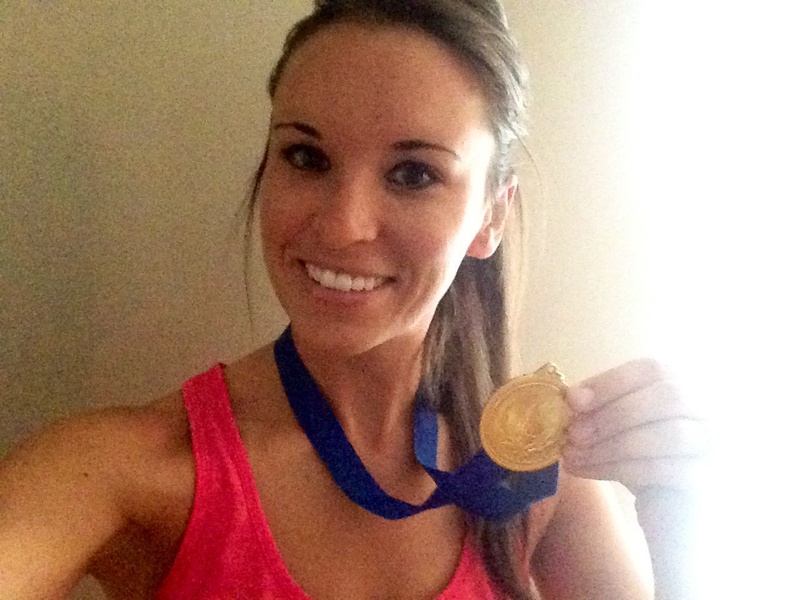 Today, I have another Champion Athletes With Diabetes story. But Ellen isn’t just a runner living with diabetes. She’s also living with cancer. Her sister Terri sent me an e-mail letting me know about her sister’s remarkable achievements, and I want to share part of them with you now. Is that inspirational, or what? Knowing that Ellen did all that while living with diabetes and lung cancer makes it a little easier for me to want to get out of bed and get my exercise on. 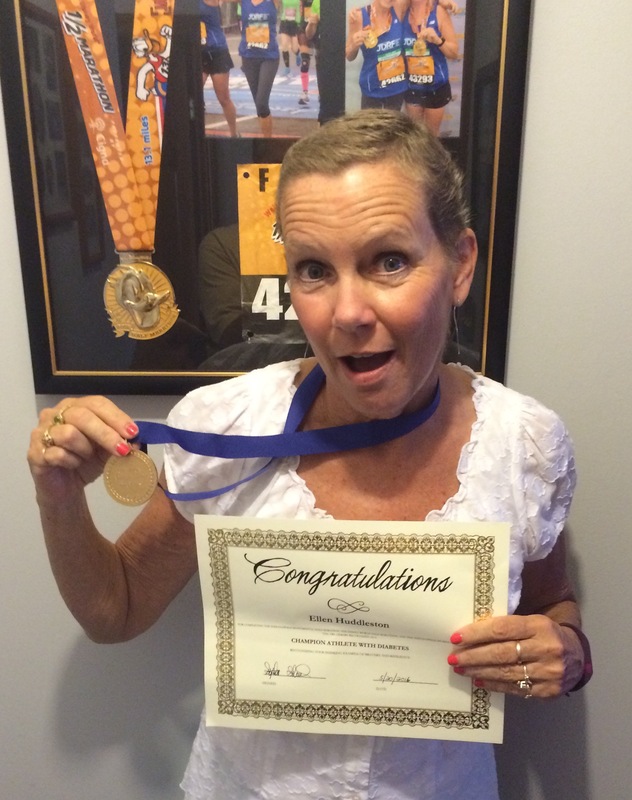 We salute you Ellen… your story makes us smile, and we are honored to award you this medal. Keep running, and keep inspiring! What about you? Are you conquering your athletic goals along with the difficulties of living with diabetes? Is there someone important in your life that meets this description? Then I have a medal for you. Send me an e-mail at champswithdiabetes@gmail.com. Tell me your name, name of the athlete (it’s okay if it’s you), and your address (gotta know where to send the medal). Most important, tell me what athletic goal was accomplished, and when. Extra points if you tell me how you felt accomplishing the goal. Full disclosure: I reserve the right to use your testimonial here, on Twitter, and on Facebook. I will not use your name if you don’t want me to. As always, I will never share private information. Join the over 80 Champion Athletes With Diabetes. Send me your story today! TWO Champion Athletes with Diabetes. 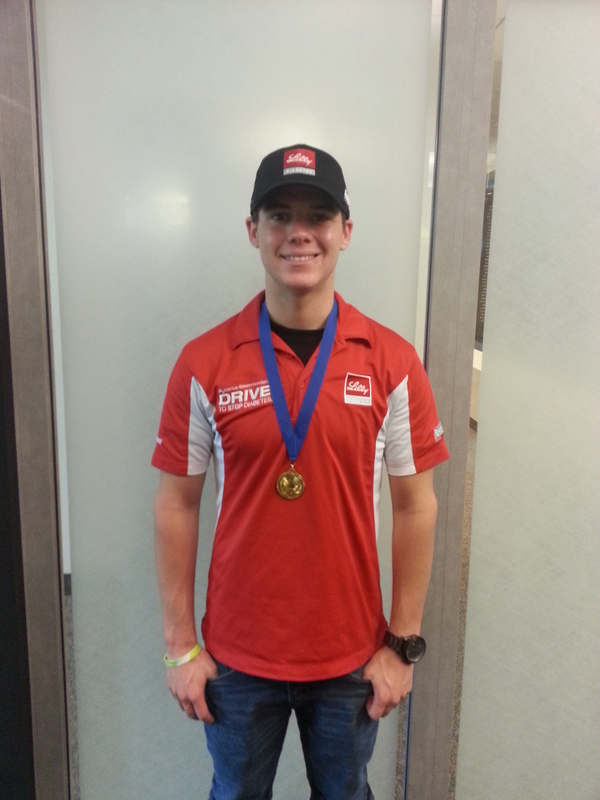 I was thinking the other day, it’s been way too long since we’ve posted a story about one of our Champion Athletes With Diabetes medal winners. Let’s rectify that. Today, I’ve got two great stories… one about an 11 year old from Belgium, and one about a 15 year old from India. That’s right… Europe and Asia are in the spotlight today. Zeno is a stellar football player in his home country of Belgium, where he lives with Type 1 diabetes. You know, football that is actually played with your feet, and not your hands (unless you’re the goalie). The rest of us call it soccer. Zeno turned eleven back in November, and this past summer, he competed and won as part of a team that captured the European Champions League under 11 championship. 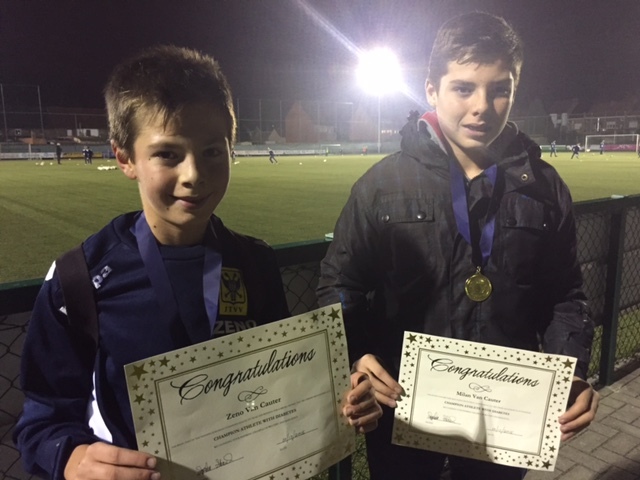 Later, his indoor team won the Limburg trophy as the top under 11 indoor team in Belgium. “During the game in the weekend, we have noticed we need to put more attention on the moment of the game (in the morning or in the afternoon) and the place of the game ( Home or away). Also the food is important before and during the game. Zeno’s brother Milan has been instrumental in helping with everything too. As a result, I sent him a medal as well. Because support is super important. This truly has been a team effort. Congratulations Zeno and Milan! Fifteen year old Jahan is a pretty awesome badminton player. In Mumbai, where Jahan lives, badminton is a pretty big sport. He also lives with Type 1, and just like Zeno, he doesn’t let that slow him down. In fact, even though he’s just 15, he’s competing in under 19 age group events. 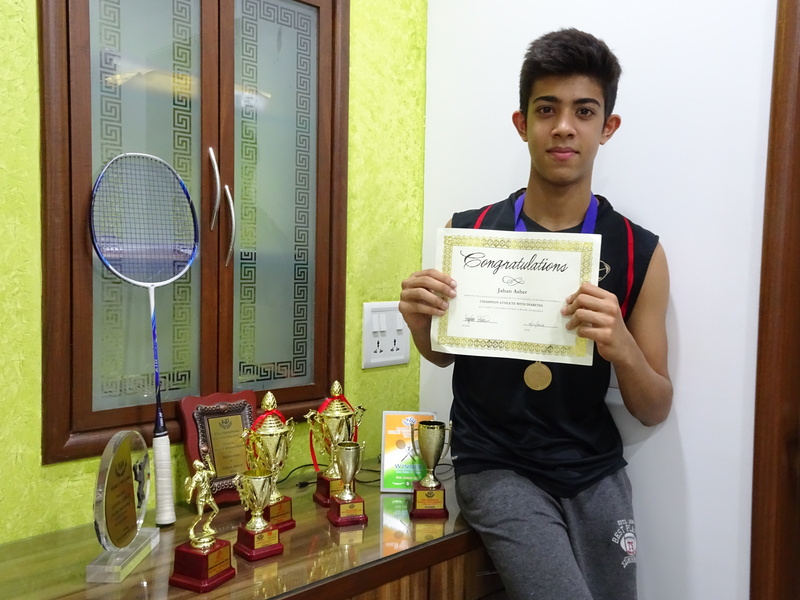 He was recently part of a doubles team that finished second in the Mumbai Suburban District Championship. And he’s now on the Mumbai district under 19 team, where he will compete at the zonal level very soon. As you can see from the photo, he’s pretty fit for a fifteen year old. His father tells me he was excited to receive the medal. We’re excited to see Jahan succeed. I salute you, Champion D-Athletes. It takes a boatload of courage to compete, or maintain an exercise routine. Heck, sometimes, it’s everything we can do just to get out of bed. Getting out of your comfort zone and taking that brave step is something that should be recognized and rewarded. If it’s a big deal to you, it’s a big deal to me too. I want to support you, or support the Athlete With Diabetes in your life. 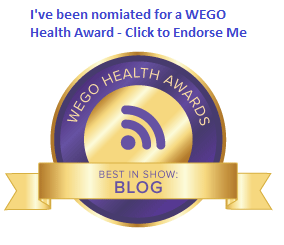 Don’t wait… send me an e-mail for your award. C’mon… there are plenty more where these came from.